By eating a hearty breakfast, you’ll give your metabolism a jump-start and have better control of your cravings. When we miss our first fuel of the day, we are often hungry by mid-morning and more likely to nibble, snack, overeat, and over compensate for any calories “saved” by skipping breakfast. Studies consistently show that, daily breakfast consumption is associated with maintaining a healthy weight. But if you’re not ready for breakfast early in the morning, listen to your body and eat when you feel it’s best for you. These muffins make your mornings super easy, grab them from the fridge and take with you out the door. You know you are filling your body with nourishing ingredients! 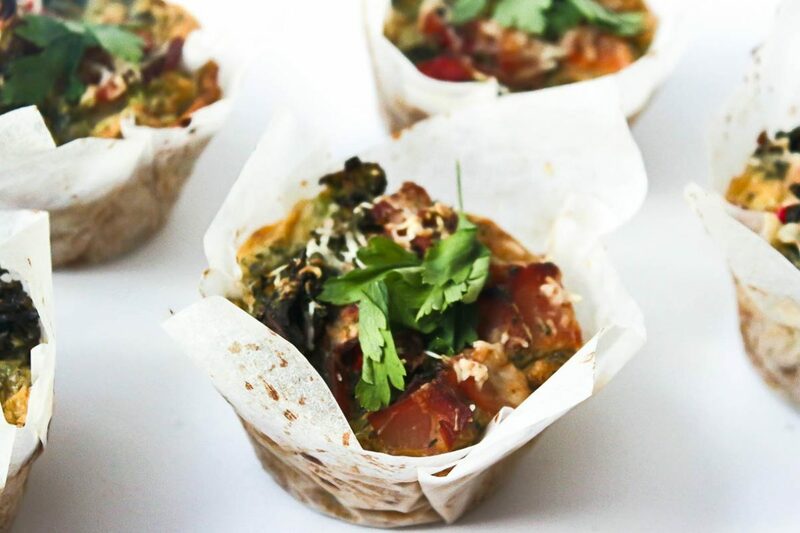 Even the kids love these healthy breakfast muffins!! Preheat the oven to 180 degrees and place muffin cases/cups into muffin tray. On a med fry pan, add the bacon to lightly crisp. On another large fry pan, add the greens, broccoli, and capsicum to lightly steam. Add a dash of hot water to the pan to create steam effect. You can also add a splash of garlic oil if preferred. Whilst steaming, crack the eggs into a large mixing bowl, add the flour and milk and use a hand whisk to beat the mixture well until there are no lumps. Add all of the vegetables, herbs, a pinch of salt and pepper and gently to combine. Pour the mixture into the prepared muffin tray, and bake in the oven for 20 minutes until set, check that it’s not still wobbly in the centre and give it another 5-10 minutes if needed. Allow it to cool slightly in the dish before serving. These can be kept in the fridge for 5 days or placed in the freezer to grab on your way to work!